The 22nd Annual Tibet Day’ was held in San Francisco on Saturday, December 15, 2007. The event- “Tibet Day 2007”, was co-organised by the Tibetan Association of Northern California (TANC) and the Bay Area Friends of Tibet (BAFoT) as well as San Francisco Team Tibet (SFTT). SFTT is a coalition that includes TANC, BAFoT, The Committee of 100 for Tibet (C100), Students for a Free Tibet (SFT), Cyphertown, and the San Francisco Tibetan Youth Congress (SFTYC). Tashi Dhondup George earlier reported Phayul.com that hundreds of Bay Area residents were treated with some authentic Tibetan music, food, arts and crafts at the celebratory event. The event also included a panel discussion on Tibet campaign strategies in the run up to the 2008 Beijing Olympics. A statement from the United States Congressman Tom Lantos was read out by his Human Rights Special Assistant Margery Farrar at the Tibet Day function. Just last week, the world community joined together to mark International Human Rights Day, an occasion that affirms the universal human rights of every man, woman and child. The goal of this annual event is to commemorate the signing of the Universal Declaration of Human Rights by the United Nations General Assembly nearly 60 years ago. Just like the powerful symbol of Amnesty International, which is a candle surrounded by barbed wire, this annual celebration demonstrates that even in the darkest corners of the earth, there are those who are willing to shine a powerful light on human rights abuses. As we stand here today, we are approaching the 60th anniversary of the Chinese government’s forcible takeover of Tibet. Despite this stain on Chinese history, the government in Beijing is busily preparing for the 2008 Summer Olympics, which the International Olympic Committee has chosen them to host. One more anniversary is especially important to me, and I believe to us all. 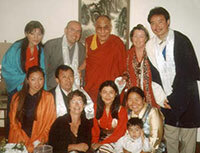 2007 marks twenty years since His Holiness the Dalai Lama first publicly presented his Five Point Peace Plan for Tibet. He made this presentation in Washington, D.C., after graciously accepting my invitation to attend a meeting of the bipartisan Congressional Human Rights Caucus, which I co-founded in 1983 and continue to co-chair. As we approach these anniversaries, we must ask ourselves serious questions about China’s human rights record, and particularly their actions in Tibet. A review of this record is nothing short of appalling. We find cultural genocide, massive population transfer, and irreparable environmental damage through widespread plundering of natural resources in Tibet. To carry out these policies, while also maximizing economic benefit to its central government, China continues to exercise suffocating bureaucratic control, which prevents Tibetan religious and cultural expression and severely limits Tibetan educational and economic opportunities. The newly built China-Tibet railroad further backs a pervasive Chinese military presence in Tibet, by which China suppresses each outbreak of non-violent protest with immediate arrest, torture, and prison sentences for those civilians, monks and nuns who have dared to protest. China’s human rights infractions are not limited to Tibet. The government has made devil’s bargains with states like Burma and Sudan, adding to the suffering of populations already under siege. Standing in stark contrast to these horrors is the record of peace and justice of my friend the Dalai Lama. His Holiness has tirelessly led efforts to care for tens of thousands of Tibetans who have risked their lives to escape occupied Tibet. He meets every refugee arriving in India, and the Tibet Government in Exile sees to their basic needs for food, clothing, and shelter while they become self-sufficient. Unaccompanied children receive support and academic and Tibetan cultural education in children’s villages or monasteries. Recently, His Holiness has encouraged more of these young people to return eventually to Tibet, to help Tibetans at home preserve their culture and their hope. 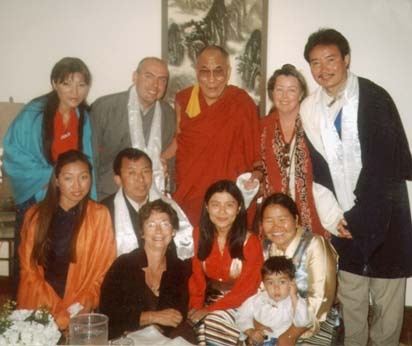 The Dalai Lama has devoted great effort to sharing Tibetan culture with a global audience, and has encouraged other Tibetan teachers to do the same. The result is that during the past sixty years, interest and understanding of kindness and compassion as primary principles for human affairs and government, taught in Tibetan culture, have spread throughout the world. His Holiness the Dalai Lama continues to be exceptionally clear about his position on autonomy. Despite many false claims by the Chinese government to the contrary, he aims only for cultural and religious autonomy, and not full independence. These are basic rights of the Tibetan people, and I urge China to grant such autonomy without delay. The past few decades have brought tremendous change for those of us dedicated to addressing the crisis in Tibet. The Dalai Lama has gone from an unwelcome guest at the U.S. State Department to a worldwide celebrity and Nobel Peace Prize winner. He is regularly received by heads of state and other dignitaries. Just this year, in one of the high points of my legislative career, I had the privilege of introducing and, in partnership with Senator Diane Feinstein and others, passing a bill to award the Dalai Lama the highest civilian honor Congress can bestow – the Congressional Gold Medal. These great strides would have been impossible without the constant support of the San Francisco Bay Area Tibet human rights community. It is clear that despite real efforts by the Chinese government to suppress the truth, China is now well known around the world, in kitchens, coffeehouses, and government buildings, for its continuing egregious human rights violations against the Tibetan people and other minority groups. Increasingly, China also is known worldwide for its reprehensible enabling of the juntas in Sudan and Burma in genocidal acts and crimes against humanity toward their own people. Spreading this knowledge is an enormous accomplishment of the world’s Tibetan and wider human rights communities. While we have much to be proud of, there is still much to be done, and we must look forward together. I do not pretend to have a crystal ball, but I can tell you that there is light at the end of what has been a very long tunnel. China is becoming engaged in the world community, and has played an increasingly constructive role in Six-Party negotiations to prevent North Korea from continuing its development of nuclear weapons. Right now, today, we have a unique window of opportunity to pressure the Chinese government into reforming their reprehensible human rights record: the approach of the 2008 Summer Olympic Games. It is of foremost importance to the Chinese to project a modern, enlightened image during its moment on the world stage, and we must demand real steps forward before, during and after this event. There is real progress to be seen for all of us who have worked hard for twenty years or more to achieve human rights for the people of Tibet, China, and other countries whose crimes against humanity China supports. Yet we can always look for more ways, as the Dalai Lama has suggested, to engage in mutual enlightenment with the good scholars, environmental activists, governmental officials, and business people who can be found among the Chinese people. We will go forward together in 2008. I can promise you that I will work tirelessly to encourage my colleagues in the United States Congress to focus on our human rights goals, and ensure that they never turn away from the people of Tibet. Thank you very much.The 22nd Annual Tibet Day’ was held in San Francisco on Saturday, December 15, 2007. The event- “Tibet Day 2007”, was co-organised by the Tibetan Association of Northern California (TANC) and the Bay Area Friends of Tibet (BAFoT) as well as San Francisco Team Tibet (SFTT).